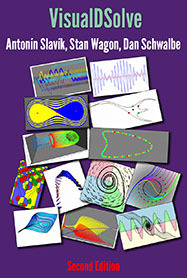 VisualDSolve is a Mathematica e-book and accompanying package showing how Mathematica's visualization tools can be used to enhance the viewing of solutions to differential equations. The book contains 18 chapters; the first 5 serve as a manual to the many functions of the package, and the other 13 are comprehensive examples. The package itself has some new ways of viewing differential equations. Two noteworthy examples are the use of curvy fish shapes to describe the vector fields determined by a differential equation, and the use of colored nullcline regions to describe the different types of directions for an autonomous system of two equations.